By 2035, anyone born after 1965 can only claim the Aged Pension after turning 70, not 65. As a result, unlike our parents and grandparents, most of us will get five less years of pension support in our lives. It’s clear that people need to be much more active in ensuring that they are prepared for their financial future. According to the Australian Bureau of Statistics, three times as many people retire on the pension compared to those who retire on their own funds. Not only that, half of all retired couples had an annual pension income of less than $28,260 a year, and half of all retired single people had an annual income of less than $21,700 per year. I clearly remember working with some clients that were in this exact situation when I was starting out as a Mortgage Broker. The couple were in their 60’s and were about to retire. They had a loan against their home that they had regularly drawn up on and nice new cars in the driveway with big loans against them. It was such a shame to see two hard working people end up with a very meagre retirement, simply because they had not managed their money well and had not prepared for their retirement. Sadly, the financial reality for this couple was that when they stopped working they would likely have to sell their home, go on the pension, and rent. At the very least, it should be everyone’s goal to pay off their home loan. If you own your home outright, you have so many more options, such as downsizing, moving to a retirement village, or taking out a reverse mortgage to realise an extra income in retirement. 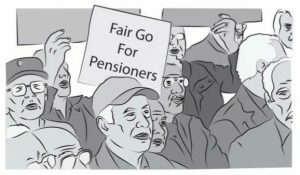 However, the reality is that, in the future, 3 out of 4 people will end up with the pension as their main source of income.